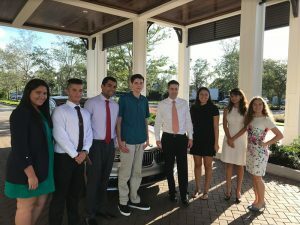 In the Spring of 2016, The Pelican Bay Rotary and Germain BMW of Naples donated $46,000 to cover two years of tuition for eighteen Collier County students to attend Quest for Success, a college preparatory program that helps high school students prepare for standardized tests, apply to colleges and universities across the country, and apply for financial aid opportunities. Two years later, that $46,000 has helped these eighteen college-bound graduates gain acceptance to some of the best schools in the United States and has resulted in over $8.5 million in four-year scholarship offers. Germain BMW donated a two-year lease for a 3-series sedan to help generate money to sponsor these deserving students in the Quest program. 200 raffle tickets were sold at $100 per ticket, totaling $20,000. This is the third year Germain BMW has partnered with Quest for Success and the Pelican Bay Rotary in supporting educational opportunities for Collier County children. The Pelican Bay Rotary donated the remaining $26,000 to cover the Quest tuition. Before receiving the funding, these students were interviewed and selected by the Pelican Bay Rotary. The students came from high schools across Collier County, including Gulf Coast, Barron Collier, and Golden Gate. Not only are these students exceptionally hard working, but many also face incredible challenges in their personal lives, making the donation even more significant. The valedictorian from Golden Gate High School received one of these scholarships and will be attending Harvard University in the fall with a full ride. Sue Zumstein, the Executive Director of Quest and Honorary Member of the Pelican Bay Rotary, was invited to speak at the meeting on August 3rd. Eight of the scholarship recipients stood by her side to share their Quest experience and to thank the organization that invested in their bright futures. “We could not have gotten to this point in our lives without the generous donation made by the Pelican Bay Rotary and Germain BMW. Thank you for seeing our potential and giving us the opportunity to reach our goals. We are extremely grateful”, one student remarked. James Koser, head of sales at Germain BMW, was also present at the meeting and pictured below. The attached photo shows some of the students who spoke on August 3rd. As a result of Germain BMW’s and Pelican Bay Rotary’s charitable gift, all of the eighteen students will be attending college with substantial financial aid packages. Of the eighteen recipients, six received full ride scholarships and four received substantial financial aid packages. Two of these students will be attending Ivy League institutions – Harvard and Columbia. For more information about Quest for Success, visit https://www.questforsuccess.com. Quest is a community-based organization providing highly personalized and effective methods for students to access and pay for most college. Quest began with 10 students in 1993, and currently serves over 381 students from Collier County public and private schools. Quest’s mission is to foster economic freedom through education by empowering high school students to reach their highest career potentials through lifelong learning. A tax-deductible gift to Quest for Success is an investment in Quest Scholars – empowering them to succeed in college and beyond. Community support allows Quest to bridge the gap between exceptional, under-served youth and leading institutions of higher education.